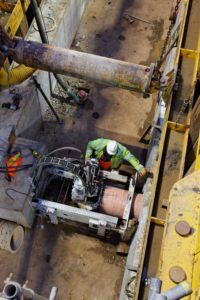 OnSite are specialists in a wide range of pipe repair and installation techniques including Guided or unguided Auger Boring for new pipe installation. Optically (or laser) guided auger boring is the best solution for installing new pipes in virgin ground where accuracy is critical. Our highly trained operators achieve stunning results with this system. The trenchless technique of guided auger boring delivers a range of benefits. A lower cost solution where space is available and accuracy is less important. 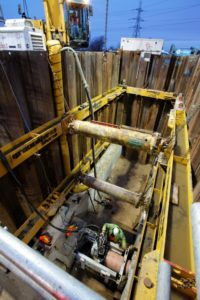 Either operated from conventional launch pits/shafts or from within existing pipes. Our Bohrtec BM150DT auger boring rig is a new design and was the first to be used in the UK. It is ideal for use in difficult locations with restricted access and can be broken into man portable sections. Installations through restricted easement, alleyways, single track roads etc. Main connections to live manholes located within the highway (steel sleeve can be used if the receiving manhole is too small to install clayware). We also provide auger boring where the depth of the open cut trench exceeds 4 meters. This reduces the cost when we’re installing your new pipes.